this product is only available to new construction builders and their home buyers - the site must be registered with axcess mortgage and loans financing co. ltd.
Not many lenders offer a new construction home loan for pre-construction home purchase for periods longer than 120 days. This creates a dilemma for the residential home builders. They need assurance that their buyers have the financial ability to close on the home they are building for them. Builders have to assure their bankers funding their construction loans that they have enough solid pre-sold clients to complete the development. Residential home builders new construction home loan for their pre-construction buyers. To solve this problem, often residential home builders work out arrangements with their own bank funding the project to pre-approve their buyers for home construction loans. But, with banks, these are not always reliable approvals. We've had clients who thought their mortgages were approved, contacting us at last minute to find them money because the builder's bank turned them down for their mortgage. They have to close on time or face home builder law suits so, at last minute, they grab quick more expensive financing, even private bridge financing, to get out of the mess they've been thrown into by the bank. That is not how new construction loan approval should be handled. How should new construction home loan work? We offer residential home builder buyers two categories of new construction loan approvals. Let's examine both. 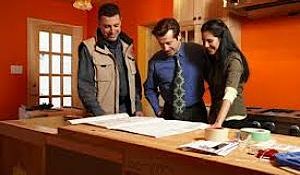 'A BUSINESS' Home construction loans for borrowers with good credit and stable verifiable income. *January 15, 2016 insured interest rates on approved credit. Rates and terms change from day to day so please ask us about updated information. This example is for illustration only. We keep in touch with borrowers and stay up to date about any changes in their credit, income and personal circumstances. This allows us to quickly make any necessary updates to their new construction home loan application to ensure their mortgage approval remains secure. IMPORTANT STEP: We contact your buyers to fully update their application -- we'll pull their credit again and get income and down payment verification ensuring there are no negative changes in their financial resume. In life things happen, but as we keep in touch with your buyers, we can make appropriate adjustments or take steps to correct the situation in time for a successful closing of their dream home. Once all that is done, buyers have two choices when it comes to the interest rate. If during the construction period of 6 or 12 months, whichever the case may be, the market interest rates have been on the rise -- no problem, provided there are no negative changes in their updated application, their approved interest rate is protected! Option 2: Clients can advise us in writing not to exercise our one-time privilege of locking-in their rate, then the lender will automatically review the rate 5 days prior to the Mortgage Advance Date and if the interest rate during this period for their selected term has been lower than the interest rate on the commitment letter, the lower rate will apply. In any case you always WIN -- we'll monitor your buyers' application and update their documents at 120-90 days before closing to ensure their mortgage is not at risk -- and, clients have 2 options to lock-in to the lender's lowest rate within the 120 days prior to closing -- but if the interest rates rise, you buyers are protected with the interest rate on their commitment. New construction home loan options if borrowers don't fit 'A' Lending - Alternative mortgage financing 'B' Lending. To start with, the two step process will be important in this situation too, with the exception of the interest rate drop which does not apply to alternative mortgage financing. Borrowers who require home construction loans with more flexible debt service ratio options or higher amortization. In these situations we cannot get the borrowers an approval for more than 60 days prior to closing. But, what we have done successfully, was to underwrite their application and advise their residential home builders what the buyers qualify for at the time of application and, that their file will be sent to lenders for a firm approval 60 days prior to closing. Often, this is satisfactory to the builder who will then require a new construction loan approval at the 60 day mark. Our clients a doctor and a lawyer in Hamilton, with good credit and excellent income qualified for a mortgage when they purchased their new construction home from their residential home builder in October of 2014. They were approved by the bank who had site representatives to support the builder's sales. Closing was eventually delayed to January 15th, 2016. In the meantime in 2015, Mr. took out an unsecured $80,000 line of credit to expand his law practice, leasehold improvements and new equipment. To qualify for a mortgage lenders require that unsecured lines of credit monthly payments are calculated 3% of balance. $80,000 line of credit = $2,400/mo is used for debt service calculations. He's been busy expanding his business and missed a couple of payments on his credit cards - this compromised his credit. Mrs. incorporated her medical practice in December 2014 to reduce her tax burden by retaining her earnings inside her corporation which is taxed at a lower rate. She only took out $20,000 as her personal 2014 CCRA line 150 income. While both borrowers were high earners, during the construction period, they structured their affairs in such a way that there was not enough unencumbered personal income to qualify for their new construction mortgage. The builder gave them two weeks notice to close on their purchase without knowing that the bank did not take any steps to keep in touch with the buyers and re-qualify them in recent months closer to closing. The bank reviewed this application at the last minute but turned these clients down for the mortgage due to the changes in their circumstances -- the buyers no longer fit the bank's lending requirements. Yes, we did get these buyers a mortgage quickly but they had to accept short term more expensive alternative mortgage financing to close on time. Had these clients been with us from start, we would have helped them maneuver through their needs achieving a balance needed to qualify for their new construction home mortgage. The message is: while buyers may qualify at the time of purchase, their circumstances can unexpectedly change by the time their home is built and is ready to close. If this should happen, we can quickly redirect their application to an alternate lender and save their dream home purchase making it possible for them to close on schedule. You have new construction loan options. So, why not give us a try -- you won't be disappointed!